It's another notch in the belt that is tightening around the disease of equine laminitis. In 2016, the Animal Health Foundation funded a study at Australia's Queensland University of Technology to test the effects of fertilizing or "improving" pasture grass in paddocks where horses with Equine Metabolic Syndrome (EMS) will be grazing. The study is conducted by Professor Martin Sillence and Melody De Laat, DVM, PhD. 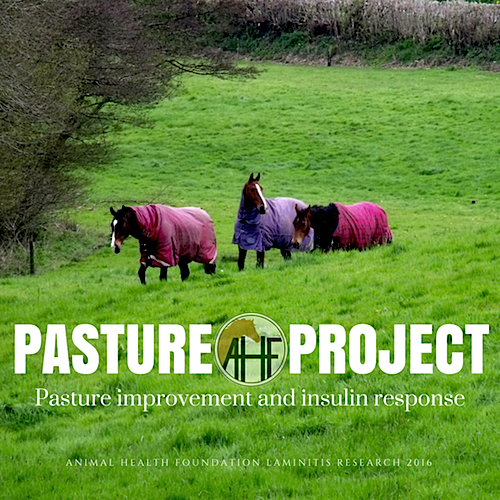 The team will investigate the role of pasture improvement in the insulin response to grazing in a herd of ponies with EMS, and compare it to normal ponies. Determining which factors potentiate insulin responses to forage feeding in horses will enable more accurate assessment of laminitis risk. Further, determining which pastures are safe, and which ones pose a significant risk to horses and ponies will help mitigate laminitis risk more effectively. Recently, QUT's Director of Alumni and Development, Simone Garske, wrote to Dr. Don Walsh, founder of the Animal Health Foundation and thanked him for the AHF funds, which total $97,593.41 in Australian Dollars ($75,000 in US Dollars). Large and small (mostly small) donations to the Animal Health Foundation from concerned horse owners and professionals has made research like this possible. This is an example of a research with direct and immediate benefit to horse owners. You can play a role in the war on laminitis. Click the "donate" button or contact AHF to be part the effort to end this disease. Or, remember a horse with a donation to the Laminitis Memorial list.